That’s the famous epigraph that player’s donning their VR headsets and entering into the nuke-blasted world of Fallout 4 VR will see later on this year, and while that saying concerns itself with conventional warfare, it also holds true of marketplace warfare as well. At least, that’s what I hope after seeing at IFA 2017 a range of new virtual reality headsets that look set to join the fray, challenging the dominance of the PC VR market by the Oculus Rift and HTC Vive, and fighting for our hard earned cash. What I would love to see is this flood of new pretenders to the VR throne help drive competition, encourage innovation and lower prices of PC-based virtual reality. We’ve already got a sense of that with the Oculus Rift getting a hefty price cut last month, with HTC dropping the price of the Vive by 20% a few weeks later. Were these price cuts made in anticipation of an influx of competitors? Perhaps, but what’s important is that virtual reality on PC is becoming more affordable, which means more people can experience it. So far we’ve seen the Dell Visor, Lenovo Explorer, Acer Mixed Reality Head-Mounted Display and Asus Windows Mixed Reality Headset at this year’s event. While these headsets are billed as mixed reality devices – rather than straightforward virtual reality headsets – they should be able to handle VR games. On the whole these headsets are cheaper than the Vive and Oculus Rift, and they are easier to set up, thanks to outward facing cameras which negate the need for setting up sensors around your room (a tedious necessity for room-scale VR, or so the HTC Vive used to claim). Price and convenience are two big roadblocks for potential VR customers, so I for one am excited to see established companies (and newcomers) find new ways to knock these obstacles down (much like how I send ornaments flying while I flail around with a VR headset on at home). Another interesting headset shown off at IFA 2017 was the Zeiss VR One Connect, which uses your smartphone and a headset to broadcast SteamVR PC games into your eyes. It’s an interesting bridge between mobile and PC VR, and if it works as promised, could further lower the price barrier for PC virtual reality. What of the old guard? So where does that leave the already established big beasts? They’re going to have to adapt or die, swept away by this new tide of headsets. Dropping their prices is a good start, but I’d like to see them come out with new, improved and innovative products. 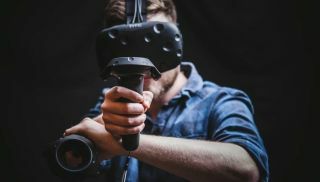 I’ve been playing around with the HTC Vive and while I have enjoyed using it – and can definitely see the potential in VR for the future – I don’t think it’s quite worth the money, even with the price cut. My gripes are mainly to do with the size and weight of the headset, the mess of wires that need to be connected to your PC, the unconvincing screen quality and field of view, and the awkward setup procedure. All of these can be remedied in the next version of the Vive – so I hope the influx of competitors will encourage HTC to come out with an even better product. Virtual reality is still in its infancy, so what we don’t need is a few competitors getting stale and complacent. We want a good old fashioned battle for innovation, and as IFA 2017 has shown, there’s plenty of companies willing to take up arms. And yes, I did make a Star Wars Episode II: Attack of the Clones reference in the title. Sorry.